Bulky oversized household items are often inconvenient to remove and dispose of due to the sheer size, weight and time required to get the job done. Once it is out the door, it could end up at a landfill, on the nature strip or skip bin. Leaving the junk on the nature strip too early for council pick up can be seen as illegal dumping in Sydney and you can be penalised. The Inner West Council provides free rubbish collection for bulky items only via their online booking system. There are no scheduled dates available for council pick up. Here, residents from the Inner West Sydney can arrange to remove unwanted household junk by placing it in front of their property on the kerbside for the Inner West Council to collect. These items are junk that are too large to fit into our weekly wheelie bins. Residents are able to make a booking and cancel according to their needs by providing their details online. 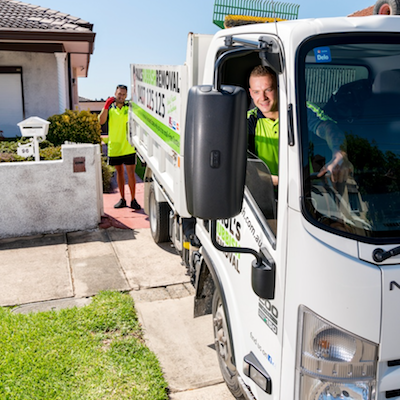 The Inner West Council allows for the collection of up to 2 cubic metres in volume for each collection booked and should be no longer than 2 metres in length. There are certain household waste that the Inner West Council will accept as shown below. A maximum of 3 mattresses can be disposed of per booking. There is always the option of disposing of the junk yourself at a local recycling centre to ensure that your waste is properly disposed of, and not thrown into a landfill where it is left to produce methane gas. This greenhouse gas has a negative impact on the environment as it is up to 20x more effective than carbon dioxide in trapping heat in the atmosphere. A fee will be required to use their recycling facility. Household items and furniture e.g. dining table, chairs, lounge, drawers, bookshelf. If you have hazardous waste that needs to be disposed of, the Inner West Council has annual events where you are able to drop off your hazardous waste and household chemicals. Mattresses can be recycled if they are relatively in good condition. It is always good if you can find viable alternatives for items that have a possibility at renewal. Landsavers are partners of the Inner West Council to recycle mattresses and distribute them to charity. Which suburbs does the Inner West Council cover? The Inner West Council covers 28 suburbs and an area of approximately 35 km squared with a population of over 182,000 (2016 census). Throwing out your unwanted household waste in front of your property is never desirable. It is unsightly, messy and attracts pests to your lovely home. This can be a big problem in the Inner West due to the narrow streets and limited space available. Paul’s Rubbish Removal services are aimed to prevent the dumping of your household junk onto the streets. We will enter your premises to hand remove almost all type of rubbish. Best of all, our same-day rubbish removal allows you to get your unwanted household junk disposed of today at a time that is most convenient for you. We’re here for you 24 hours a day to clean up your garage, basement, backyard or anywhere else in your home from large junk. Request a free quote from our team today on 0407 125 125!